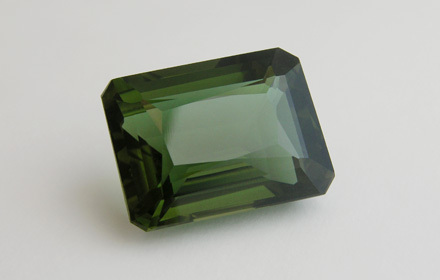 Weight: 25.65 ct; size: 20.01 | 15.45 | 11.00 mm; shape: octagon; colour: dark yellowish green; clarity: eye clean; cut: good. Big, very clean specimen; commercial cut; good polish. Produced using a hydrothermal synthesis, a method of synthesis of single crystals that depends on the solubility in hot water under high pressure.